It was hard to leave such a spectacular spot as Cape Lookout. Beau decided to lay over a day. Probably the last I'll see of him. The day started with a big climb. Charley, whom I met the night before, and his friend Bill who joined him for a day ride, were riding with me. Bills wife was SAGing their gear so they were riding light. Even so I was able to keep up with them. The road was still quiet and ran though more lush forest with occasional views of the ocean, from way up high. Then it was a fast descent to Pacific City. 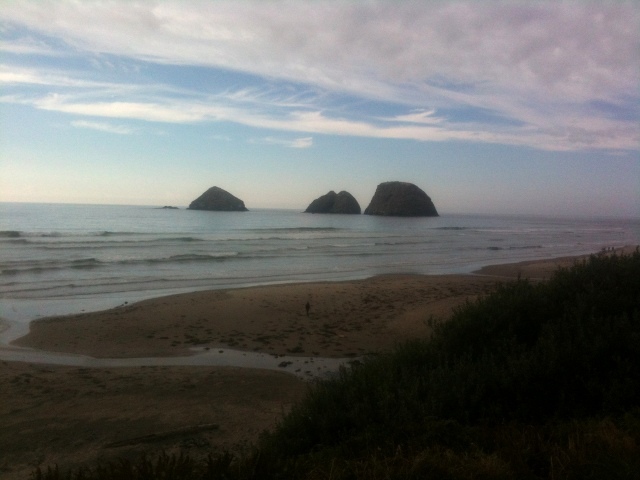 Pacific City is home to the famous Pelican brewery and pub, and the place was hoping. It was full on sunny and warm now and their was a lot going on. There was a surf contest, hang gliding off of Cape Kiwanda, and hundreds of beach goers. We stopped for lunch and spent a good deal of time eating and watching the people. From Pacific City the route joins 101 again for a while before turning off at Slab Creek which takes you to Old Scenic Highway 101. The sign said "road closed ahead" for construction but we ignored it. It was nice back road up a scenic coastal valley. At the top there was a couple of hundred feet of construction. Unpassable by car but an easy walk for us. We were happy for it since in meant no cars on the road for the scenic downhill. This was the back way over Cascade Head, which is the biggest climb on 101. Much nicer on this route. When we got to Otis I parted ways with Charley and Bill and took the North Bank Road which follows the Salmon River uo to my friend Scott's house, where I would spend the night. We passed the road to Three Rocks, but these were not those three rocks..